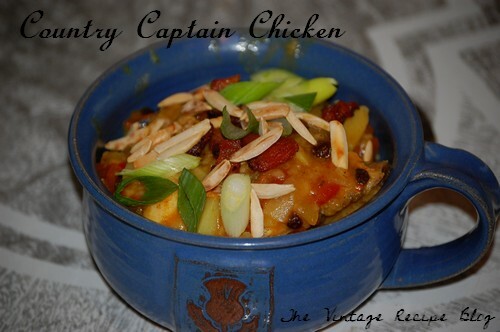 I chose a rather laborious title for this post because most people don't know the Americanized version of chicken curry is rightfully called Country Captain Chicken. Now the origins of this dish are veiled in the mists of time as it has been around since before the Civil War and quite a few towns make claim to Country Captain as being "their" dish. After looking at literally dozens of recipes dating from now all the way back to 1822 I can say with a high amount of confidence that this dish is a New Orleans Creole recipe. You can usually tell the background of a recipe by it's base ingredients and Creole cooking is one of the easier ones to spot as almost all dishes start with at least 2 of the "Trinity", bell peppers, onions and celery. These ingredients showed up time and again in each recipe I looked at, albeit with some variations as time went forward. I picked a recipe that was simple and stayed close to the original in terms of ingredients and flavor. Take your currants and cover with wine in a bowl and set aside to soak. Season your flour with salt and pepper and cut your chicken into chunks. Coat chicken with flour and set aside. In a large heavy pot heat 1/4C lard until shimmering then drop in chicken and fry until browned. Remove chicken to plate and add more lard if necessary before adding in onion and bell pepper. Saute until soft then add garlic and stir for 1 minute before adding tomatoes and juice from cans. Add thyme, curry powder and season with salt and pepper to taste before adding chicken and currants (along with wine). If using boneless chicken simmer for 15 mins until heated through. Serve hot over rice garnished with toasted almond slivers and slices of green onion.